Live edge wood is having a moment. It is rugged yet elegant. Timeless yet also on-trend. Most importantly? It is unique, with no two live edge pieces ever looking the same. This unique beauty has made live edge furniture one of the most desired style statements in today’s market. At Vantz Furniture, we know live edge wood like few companies can. At our Laconia, NH-based workshop, we offer impeccably crafted live edge wood furniture, countertops, and slabs that are inspired by nature and handcrafted just for you. No matter you live edge needs, our master craftsmen approach each wood piece with an eye for artistry and custom design. In fact, we believe in custom every step of the way. We keep a vast inventory of exotic and native hardwood slabs on-hand, meaning that every client has the opportunity to select a slab that works with their design goals and lifestyle needs. Texture, appearance, and longevity all come in to play when you’re selecting a live edge piece. From there, though, the design options are only limited by your imagination. 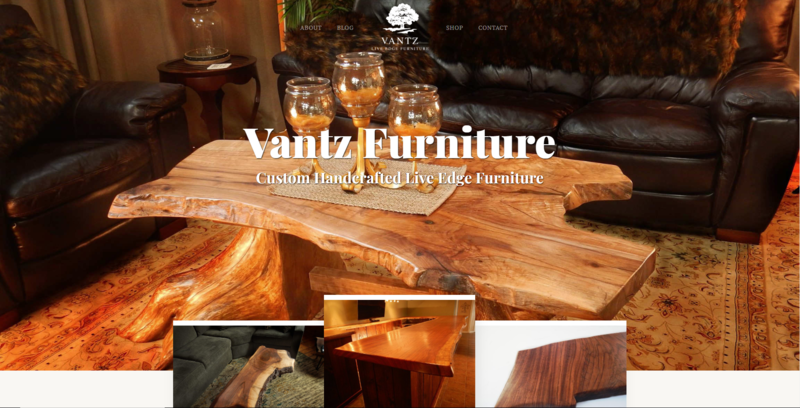 Whether you’re looking to have a new live edge piece constructed from scratch or you’re aiming to renovate an existing element in your home, at Vantz Furniture, it’s easy to incorporate live edge into your home. If you’re looking for something bold, a live edge countertop can drive the total design of your room. Meanwhile, for something more subtle, a coffee table or side table might be a more suitable choice. Whether you’re looking for a countertop, small side table, or something else entirely, in our 4,000 square foot furniture showroom, you’re sure to find inspiration. Live edge dining tables, benches, desks, conference tables, headboards, coffee tables, vanities, and countertops are just the start. In addition to our custom design work and showroom options, we offer a variety of unique pieces available for purchase online. For more information about custom live edge furniture, please contact us today.